Is your chain link fence looking old and tired? Maybe it’s time to spruce it up with a new paint job! Now that spring is almost here, it won’t be long until the weather is warm enough for you to tackle this fairly straightforward project. Learn everything you need to know about painting a chain link fence in our blog. Before you paint your fence, you’ll want to remove any rust on it. If you paint over rust, the paint will not be able to adhere to the fence properly and will peel off in a relatively short time. To remove rust, use a wire brush or rented sandblaster. After using the wire brush, use a fine-grade sandpaper to smooth out the aluminum. You should also remove any flaking paint or spots of grime you find, because both of these will also mess up your paint job. Use a spray-on rust inhibitor to treat any corrosion you find. Now it’s time to paint. You’ll need aluminum paint to paint your chain link fence. Use a long-nap roller and slowly roll it over the chain links. Make sure to get every part of the aluminum, including any spots that might not be in the initial range of the roller. Don’t put too much paint on the roller, otherwise you’ll get a lot of dripping and running. Are you looking to install a chain link fence in Richmond on your residential or commercial property? We offer a number of different grades and strengths of chain link fencing for every application. We custom manufacture residential gates to fit, and use structural steel gate hinge posts for the highest level of performance. Our residential grade fence usually uses 11 gauge fabric and 17 gauge tubing posts. 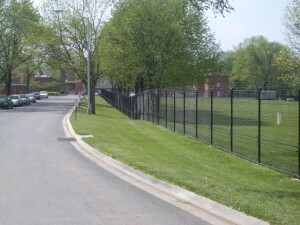 We also offer coated chain link fence. Polyvinyl coated fence can be thermally bonded for maximum strength. Polyester coating is baked on for extra scratch-resistance. To learn more about chain link fence for residential and commercial applications in Richmond, contact us today! Hercules Fence of Richmond has been providing professional fence installation and service in Richmond for more than 50 years. Call us at (804)752-7992 or contact us on our website to learn more about residential and commercial fencing in Richmond. This entry was posted on Thursday, March 12th, 2015 at 8:44 pm. Both comments and pings are currently closed.